There are many ways to live life. One approach is to focus on your values, translate these into a clear vision and deliver visible results. Let’s explore some steps to making this happen. What are the values you want to follow in your life? Different people give different answers to this question. Here are some of the things they say. To be kind … To be a good parent and partner … To encourage other people … To do my best … To create beautiful things … To follow my religion … To show reverence for life … To do good deeds each day … To make a positive contribution to the world. Whilst people may have different values, there also seems to be several universal themes. The VIA Institute has spent many years collected data about human virtues and strengths. Part of its work focused on clarifying the qualities of moral excellence that are admired across different philosophies, religions and cultures. VIA found that people admired the following six groups of virtues. Each of these themes was expressed through various strengths. Here is a summary of there findings. You can discover more via the following link. People feel more at ease with themselves when they follow their values. Sometimes this can be tough, of course, but not as tough as not being true to themselves. If you wish, try tackling the exercise on this theme. This invites you to describe the values that you want to follow in your life. Looking back at your own life, can you think of a time when you translated a value into action? You may have been standing up for certain beliefs, aiming to protect other people, expressing your aesthetic values by creating something beautiful or whatever. What did you do right then? What were the principles you followed? How can you follow these principles in the future? Many people express their values by translating these into a clear vision. Dame Cicely Saunders, for example, did this when giving birth to the modern hospice movement and creating St. Christopher’s Hospice. This was an enormous project, but it is possible to express values in other ways. One approach is for a person to live their values through small actions. They may aim to encourage other people, create something beautiful or whatever. They get into the daily habit of expressing their values. Another approach is for a person to choose one value and explore how this could be expressed in a larger – but still achievable – vision. They may aim to write a book, design a garden, run an educational programme, produce a film or whatever. They then do something every day towards achieving this vision. 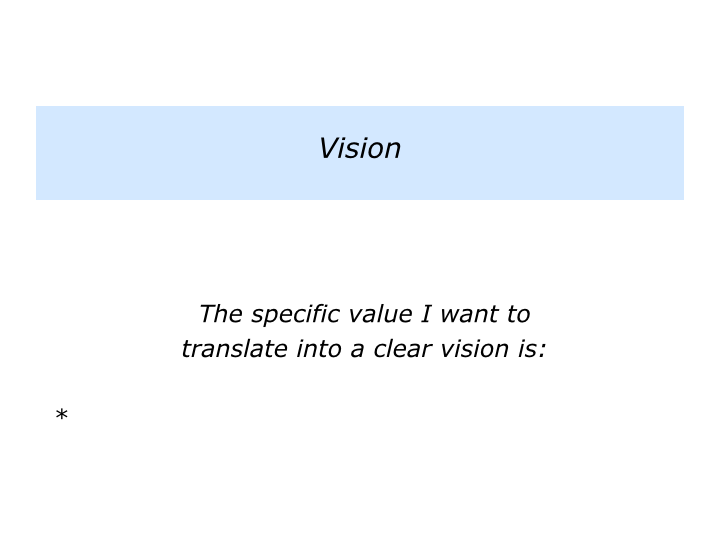 Describe the specific value you want to translate into a clear vision. Describe the specific vision you want to achieve. Describe the benefits of achieving this vision – both for you and for other people. Sometimes a person simply gets on with living their values. They may then experience the feeling of, what some existentialists called, living in good faith. Many people find that doing this gives them the strength to do their best each day. Sometimes they may want to translate their values and vision into tangible results. An educator enjoys seeing students integrate the learning. A nurse enjoys seeing a patient recover their health. An architect enjoys seeing their building take shape. Sometimes it can feel like a long climb towards achieving the desired results. So it can be important for a person to encourage themselves on the journey. Some people aim to get an early success each day. This gives them a sense of satisfaction and the energy to keep working. Each night they recall what they have learned, plus how to get some early wins the next day. They also plan how to tackle the next set of challenges on the way towards achieving the long-term picture of success. There are many ways to live life. One approach is for people to focus on their values, translate these into a clear vision and achieve visible results. Each person will choose to follow this route in their own way. If you wish, try tackling the final exercise on this theme. Imagine that you have chosen to focus on a particular value and have translated this into a clear vision. Describe how you can do your best to deliver the desired visible results.